Covering the panoramic road that from Bronte takes to Randazzo (S.S. 284), in Brancatello quarter at about 1043 of height, in a luxuriant valley which frames the impressive mass of Etna, one finds the "Canalaci Roccazzo", a sandstone mass, better known as "Rocca Calanna". After a little slope, at about three kilometers from Bronte midway between Bronte and Maletto, suddenly the horizon widens out and a big valley, full of greenery, secular woods interrupted by ancient and recent lava flows, of volcanic cones extends itself up to the feet of Etna which here raises in all of its majesty. 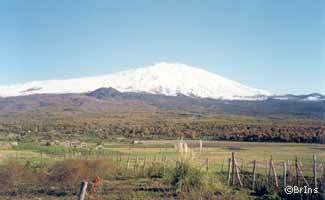 From the Canalaci Roccazzo, or the panoramic road in Difesa district, it is possible to enjoy the most spectacular sight of Etna, the highest active volcano of Europe and one of the biggest of the world. 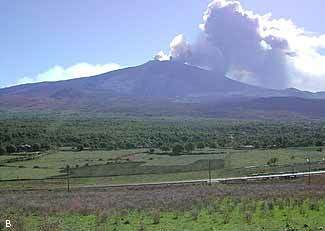 The Etna ("a muntagna", like it is called locally) rises, majestic and terrible, above a basement of sedimentary rocks to a height of about 3.350 meters, and has a diameter of about 44 kilometers. According to what Giuseppe Cimbali wrote, from Bronte "it shows itself in all the agreement, in all the purity, in all the harmony of its perfect and solemn lines". In harmony with the beginnings of the institutive decree of the Etna Park, an old project foresees in the zone of Difesa district, the building of an important tourist pole, comprising receptive and sporting structures (hotels, campsites, fields equipped for the practice of several sports, riding tracks) and an articulated system of equipped green. The zone of the Difesa is easily reachable, besides the car and the bicycle, also with the Railway Circumetnea which makes a stop right in Difesa district (soon after the station of Bronte). Besides the rural beauty, the archaeological interest of the rock is due to the presence of two excavations dug n the sandstone as artificial little grottos (the "gruttitti") which were used to bury the deceased together to a rich outfit. These funeral little cells, present a typology totally different from the several grotto tombs known in the bronze and iron age, because they present themselves like some burial niches with opening and rectangular plant while the other existing types in that period have a small corridor of access and a sub circular cell with vault. The strange typology which is found in several sandstone emersions, included between the high Simeto valley and the Alcantara valley, is at present, object of study and is assumed, at the moment without decisive tests, that can actually go back at the Byzantine epoch. The "Contrada Difesa" (Difesa district) is one of the most beautiful zones of the territory of Bronte, where, in any period of the year, the Etna, the woods, the lava castings and the cultivated fields give an image of incomparable beauty. «In Bronte’s territory, to testify of their life, or rather of their death there are, scattered here and there, some funeral cells, built like ovens, as can be found in many other moun­tains of the island, of which, to the critic eye of some future archaeologist willing to explore this western part, I wish to indicate two in the “Primaria” superior, below the “Colla” towards south, one in the “Contura” superior. 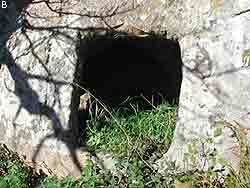 Close to the cell there is a vat and a winepress ; two at “Fontanamurata”, on the fields owned by Vincenzo De Luca and Giuseppe Rizzo, two at Margiogrande, called “Gruttitti”, in the property owned by Vincenzo Rizzo, others at Placa Baiana and Macchiafava. (…) ”remarkable are the funeral cells at Rocca Calanna, called in the Schemettau’s papers Torre Giulia or Advice Tower, located between Bronte and Maletto, along the provincial road. They have been dug in a sort of limestone marl surrounded by recent lava flows, those of 1851, were vomited by a lot of tremendous craters in the western part of Etna. Other small cells can be found at Canalaci. 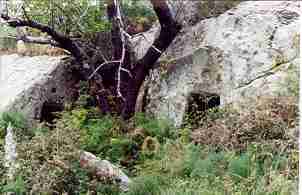 The Rocca Calanna ones have nearly an elliptical shape. Are at the feet of the rock and haven’t got a manhole cover. They are three: One, at the feet of the rock, is shaped like a corridor two meters high and one and a half wide; the second, a little higher, is divided into two rooms with pillars dug around it, at about two meters height were dug some small shelves, is square shaped and four square meters wide, at the entrance there are other two pillars of white stone. 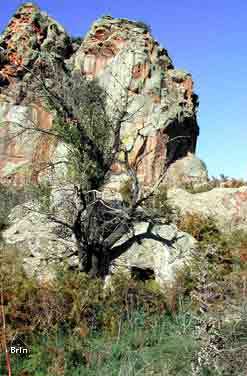 The third is high above, is nearly square with three lateral openings looking south; is eight meters long and six wide. More than tombs they look like rooms for the living: lookouts where, maybe, in the early Middle Ages, from the VI to the XII century, lived country people, devoted to agriculture and sheep farming for the safety of country areas. Some sort of troglodytes descending from the ancient Siculi, of which were left some semi-barbarian elements. 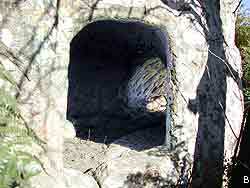 The diggings look like the caves of the famous Sperlinga castle. 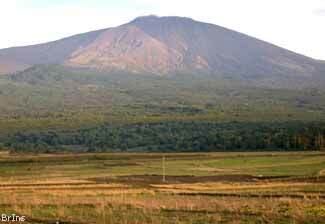 «On the highest rock of Difesa district, the “Rocca Calanna”, fell the slipper of Queen Elizabeth, when the demons in 1603 threw the queen into the Etna crater to send her to hell. A long time after, a young shepherd saw the slipper sparkle in the sun and tried to touch it but he burned his hands Then a friar exorcist was called and the slipper flew away and went to alight over a tower of the Maniace Castle, near Bronte.